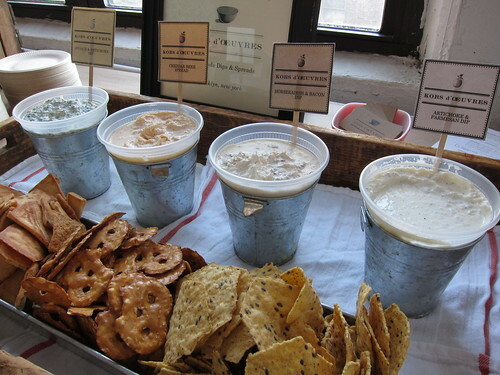 A little over a month ago, I heard about Kors d'Oeuvres, artisanal dips being sold at the Saturday Brooklyn Flea. Korey Provencher, a TV producer by day, is a bona fide dip lover and maker, and had the name ready once a market presented itself. He debuted at the Greenpoint Food Market before settling into his booth at the Flea. Once I tasted the dips he's producing I became Kors d'Oeuvres lover, it's some seriously good stuff. And this pass weekend, I made some converts. I had been waiting for an opportunity to introduce Brownie to this deliciousness, and I knew Little B's birthday picnic was the perfect one. I brought along a tub of Korey's Horseradish and Bacon-sheer willpower stopped me from eating the tub beforehand-and some pretzel chips. "That's some good stuff." "Did you try the bacon dip?!" "It's got a nice kick to it, too." "Mmmmmmm" "Where is he again?" "What others does he have?" "Can we get more?" Then before we knew it the tub was empty. The creamy dip filled with chunks of crisp bacon and given a spicy kick from the horseradish make this a dip to be savored until you've licked the tub clean. Yes, you could probably make this at home, but Korey's got the recipe down pat and wouldn't you rather spend your afternoon eating his dip while drinking beers in the warm summer sun. I know I would. 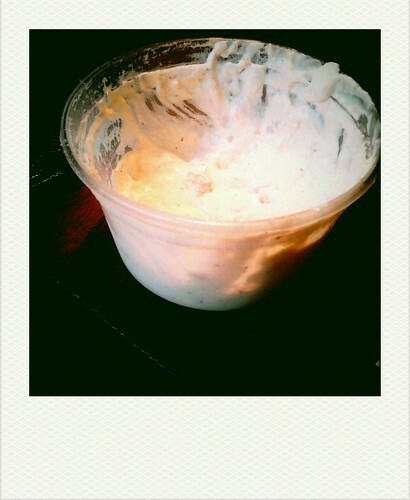 oh lord..horseradish and bacon. *cries* That sounds so good. Yuuum, that sounds so good - and I love dip! Wait until you try the blue cheese...so yummy!